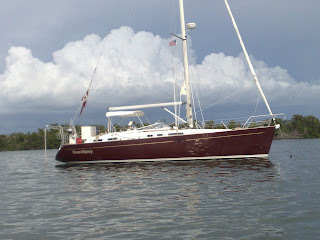 We set anchor outside of Ussepa Island, a private island adorned with dull grey but rather expensive houses. We were not really interested in this island anyway, our eyes were keen on the island across called Cabbage Key. Mind you it is neither part of the famous keys on the tip of Florida nor will you find any cabbages in copius amounts. The word 'key' is apparently an english corruption of 'Cayo' from Spanish. 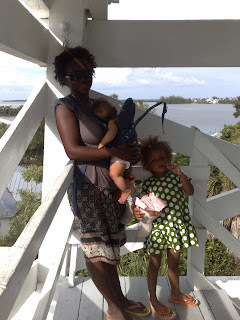 Cabbage Key is also privately owned, it was bought in the 1920's for 2500 dollars! However it is a charming little island with a restaurant and holiday cottages and has resident hole digging tortoises, not quite the Seychelles or Galapagos size but big enough. Not to mention the oddity of tortoises that dig- I have never heard of that phenomenon before. The bar leaves one salivating, not for its stock but for the 1 dollar bills pasted on the walls and ceilings. The room probably has about 4000 dollars worth of these authentic bills. It is tradition for patrons to leave signed dollar notes to mark their time at the island but how could they tempt a poor soul like me. I was already thinking how to stage a robbery, island style. Afika was quite excited as well and did not understand the reason for abandoning money on walls. 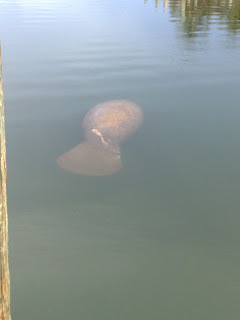 We were very lucky that day- we spotted a large Manatee. It is a large animal that resembles a seal but is much lazier. I did not even know what it was until I came to Florida. They are found all over here and in the Caribbean and in the Indian Ocean though I understand they go by another name there.